Over the last year, Procorem has seen a major increase in adoption from the Real Estate Finance, Property Management, Construction, and Legal communities. With this increased adoption in mind, ProLink has made a number of new product enhancements focused on ease of use for our clients. Let’s take a look at some of the new features. Housing Finance Agencies, which make up one of Procorem’s largest industry segments in terms of overall usage, leverage Procorem as a portal to collaborate on files, manage core tasks, and streamline communication throughout the lifecycle of their affordable housing properties. These agencies rely on Procorem heavily during compliance and busy project periods. With heavy use comes the need for time-saving measures, such as efficiencies in managing collaborators. In Q1, ProLink enhanced the process of adding collaborators to WorkCenters within Procorem. 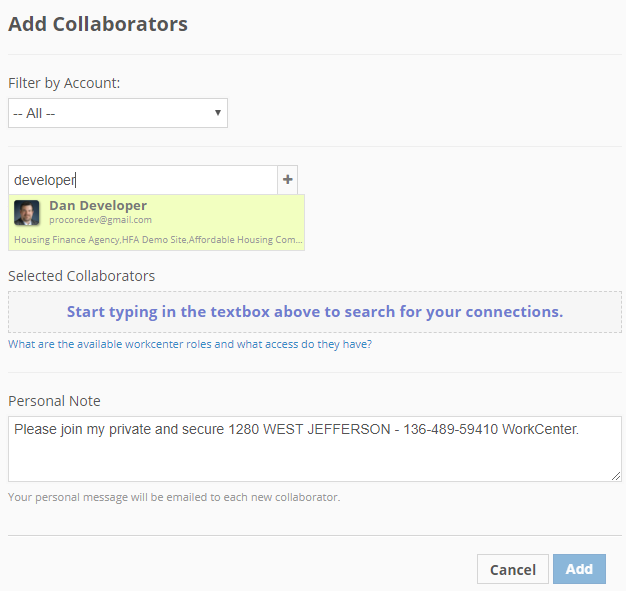 Now, after you add people to any WorkCenter, you will see their names as users on the account when adding to other WorkCenters – even before they have accepted the first invitation. As a result, you can add a new person to multiple WorkCenters quickly, saving time and ensuring your invitations are going to the correct individual. 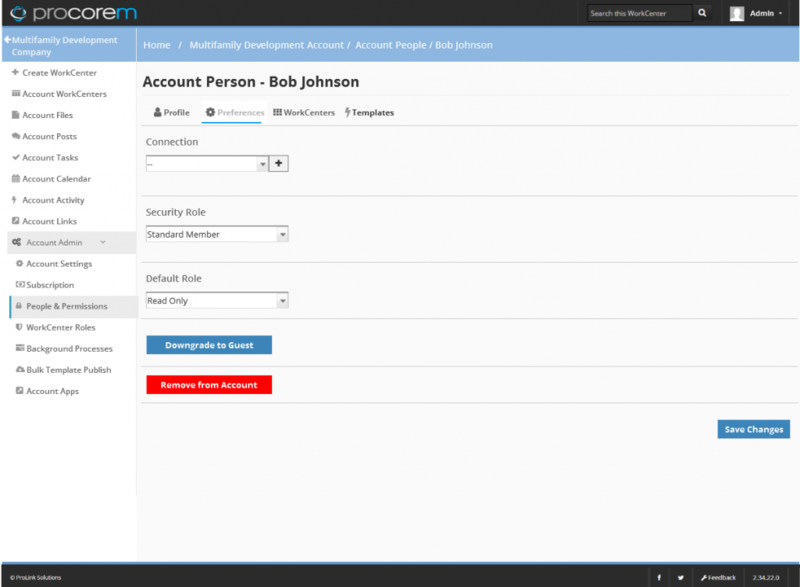 Within Procorem, WorkCenter Roles give you the ability to create any combination of Security Roles that your organization may demand. With these roles, you can control how information is uploaded, shared, distributed, and engaged with in Procorem. With our latest feature, Procorem has gone a step further to allow administrative users to create a “Default Role” within Procorem. Default Roles provide a way to define the standard security role used each time an individual is added to a new WorkCenter. While you can always adjust the Default Role, either from the WorkCenter itself, or through the People & Permissions page, this new setting is a time-saving option to ensure that the most common security role of a particular user will be the role automatically assigned when first adding the user to a WorkCenter. As the use of Procorem grows and grows, we have found the need for more streamlined processes to add, manage, and remove users in bulk. Within People & Permissions, administrative users have the ability to manage roles for any collaborator on the account in mass. This ability allows you to ensure that all the participants using your Procorem account have the right level of access to the data you are sharing. In addition, once a user is added to a single WorkCenter, that user will become available in the People & Permissions tab to then be added in bulk to all necessary WorkCenters. When bringing a new participant into your project, this bulk user management saves time managing security and user access within the system. 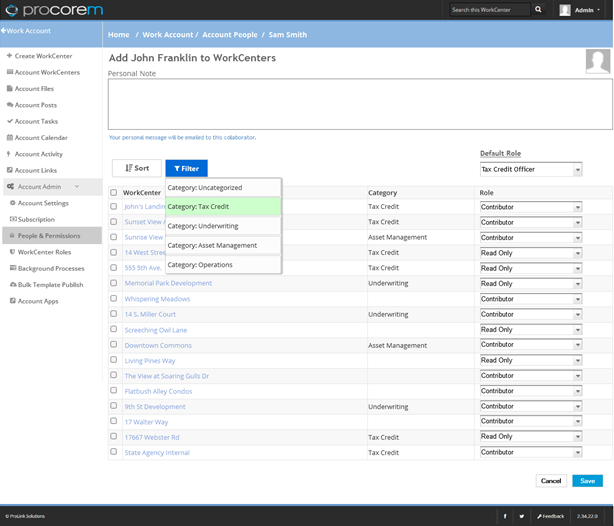 For this release, Procorem has added the ability to sort, filter, and group both roles and WorkCenters within the People & Permissions page. This improved categorization provides administrative users additional ease in managing the roles and WorkCenter access of users within the account they manage. With all Procorem improvements, client feedback is the number one driver in determining how we enhance the product and when. We hope you love these new features and would love to hear your feedback. Please feel free to contact us or give us a shout at hi@procorem.com! NICE – what prompted the fixes/enhancements? HFA users requesting? Hi Rick, Thanks so much for reaching out! These updates were in fact suggested by our HFA User Group.